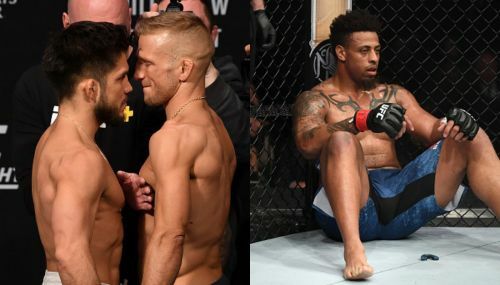 UFC Fight Night 143: Cejudo vs Dillashaw saw the beginning of a new era in the UFC. UFC started their 5-year television contract with ESPN. The main event was a huge fight between UFC Bantamweight Champion TJ Dillashaw and Henry Cejudo for the UFC Flyweight Championship. Dillashaw went down to Flyweight to face him, knowing that if he won, he would become a double Champion in two different divisions simultaneously. In the co-main event, Greg Hardy will face Allen Crowder in his debut fight in the UFC. Elsewhere on the card, Joseph Benavidez will face Dustin Ortiz, and Paige VanZant will face Rachel Ostovich. From Elbows to Arm Triangles -- this fight had it all at only 3 minutes and 21 seconds! 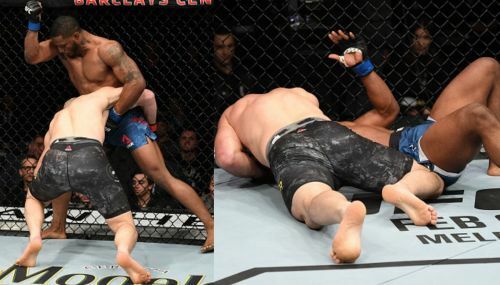 Round 1: Karl Roberson and Glover Teixeira faced off in a fight that neither fighter had time to prepare for. The two faced off, and Teixeira went for the level change and tried for a takedown. Unfortunately for him, Roberson took advantage and hit him with elbows knocking Teixeira down, and then went for the Ground and Pound. Teixeira closed the distance on the ground but was almost knocked out. Teixeira got up and took Roberson down, and mounted him instead of going for the Ground and Pound himself and an Arm Triangle. Teixeira put Roberson in a tight Arm Triangle, and that was it. Roberson tapped out.